With the widespread adoption of smart phones and tablets, IT security professionals are confronted with a new world of vulnerability and the typical frontline against data breaches has been to make sure passwords and credentials are not compromised while using these devices. However, the methods available to bypass passwords and steal data have become more efficient and discrete, especially with seven common flaws that repeatedly occur with password use. The solution to these high-tech hackers is a Multifactor Authentication system that will protect your organization and provide 6 benefits ranging from improved security to cutting costs. 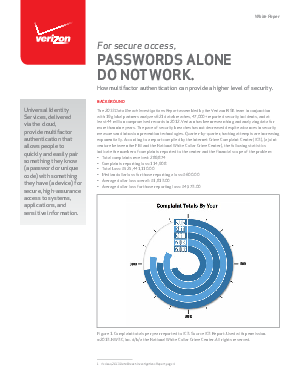 To learn more about how a Multifactor Authentication system could help your organization download this whitepaper.